These 1980's vintage French military tricot field shirts were designed as part of a layering system to be worn under French combat uniforms. Made in a pull-over style with 1/4 zip front and button cuffs, the 100% cotton jersey material is soft and ultra comfortable. 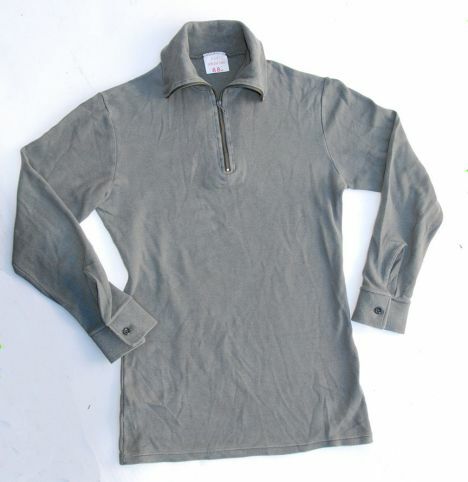 Wear zipped up for a fold-over turtle neck style for cold weather, or unzipped for warmer temperatures Olive brown in color, they are previously issued, good to very good condition with no repairs or tears. Great for outdoorsmen, hunters and those who appreciate quality Euro surplus! Just a few in stock-- order by sizes below. Shipping weight 12oz.